There are dilemmas at the time of hiring a virtual staff and thus, there is a need of making sure that the virtual staffing service you are going to opt for is able to provide you the best service and strive hard to meet the targets you set for the virtual staff you hire. There can be other important factors which you should consider while signing up for a virtual staffing service like, the flexibility of the contract is of high value. There can be a case when you are not happy with the service or the virtual staff you hire, so you should always have an option to opt out and look for the next best option available. Similar dilemmas can refrain you from hiring and probably let you fall for a virtual staffing program which later comes up with hidden clauses or manipulative terms. Virtual Staffing has been able to provide a high quality and dedicated virtual staff to all its clients and so, far approximately 91 percent of the clients have successfully been retained and are still enjoying the benefits from our high-end virtual staff network. There are several reasons why Virtual Staffing could easily provide the promised services to its clients and have been able to make the entire process of hiring and dissolving a hassle free affair. There are no extra hidden clauses or charges for the services provided by Virtual Staff. There won’t be any difference between your locally hired in-house guy and the virtual staff you hire with us. 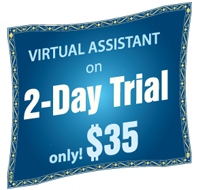 The virtual assistant that you hire is gonna do yours and just your work during his working hours. He will deliver you working hours and in those hours you can either ask them to do some research or can ask for some low-end repetitive work, it’s all up-to you. The amount you pay will remain intact whatever the nature of service you may avail. No extra charges. What can be more beneficial deal than that, having a full-time, similar to in-house employee and still not paying for any of the overhead costs which would have come with the locally hired staff. They work from a well furnished and well equipped place with all the things necessary to do the job. So, you would save heavily on the furniture, the electronic equipment and the electricity bills. The usual training time with an in-house employee may stretch over a six months, but with a Virtual Assistant or VA, it’s not so. They have a wide experience of working on different projects and are usually specialize at one or the other works. Thus, a month’s training or perhaps no training will be required to make them ready for your job. If you have some experience of working with an in-house staff and then you must be knowing how difficult it is to manage a staff, you have to hover over their heads to make sure that they are active and are working. While this can be very frustrating, it can be a time-killer. So, the staff that you hire from Virtual Staffing does not bring these difficulties with them, they are disciplined, are familiar with the code-of-conduct and are bound by the strict managing team of ours. So, they work dedicatedly to secure their spot and kill the competition posed by other VA. This competitive spirit makes them over-deliver every time. Thus, Virtual Staffing knows the importance of your precious time and it has finally worked out all the time-killer problems. Moreover, Virtual Staffing gives you an option to take the expert advice and see to the fact that there are no more things which kill your time, we will be happy to come up with custom solutions to your problems. This is a real advantage for those in dilemma, there are companies which will force you into an agreement since the very first day, but with Virtual Staffing you get a paid 2-day trial for those who love to test-drive before purchasing the real service. Moreover, the Virtual Staffing allows you to discontinue with the service after the very first month. No manipulative terms. We understand the value of your time and hard earned money. For all further queries and information, visit FAQs.